finished up stage 2 of the limoncino project. Stage 2 involves straining out the lemon peel and adding sugar syrup. finished up the taxes. Will re-do to see if I can eliminate the $2,000 we have to pay. All in all, a busy productive day. a banner day, originally uploaded by AmyEmilia. 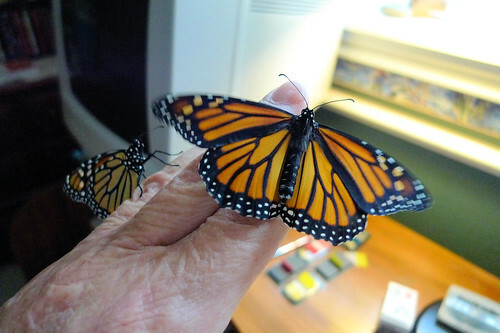 This is the first time we have actually witnessed two butterflies hatching at the same time. Even in discouraging times, the miracle of daily life is intense. dancers, originally uploaded by AmyEmilia. We have had a couple days of cool, rainy weather here in Houston - very welcome because we are running a deficit of almost 7 inches this year. 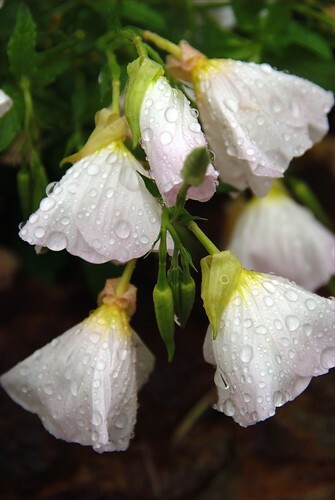 These little evening primroses (or buttercups, for Texans) are weighed down by the rain. They look like dancers to me. 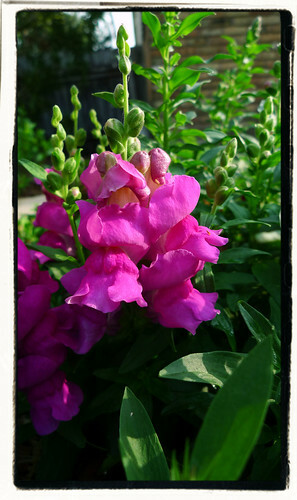 snapdragon, originally uploaded by AmyEmilia. This snapdragon is something of a surprise to us. You may recall that last year we bought a bunch of plants for just a couple dollars. Apparently among them was a snapdragon. I've never actually grown one before so I didn't recognize the young plant until it began to form buds. I love the color the flowers take on in the afternoon.